Not all Thai restaurants are created equal. Not where Montien - the newest Thai restaurant that has just opened recently at One Bangsar is concerned. Owners, Sita Jayadeva and Vivian Chan are not kidding when their outlet boasts of a 'Truly Thai' tagline. With a treasure trove of Thai recipes inherited from Sita's mother, the two best pals since school days are determined that Montien will continue the legacy where the now defunct Café d’Chiangmai, a Thai restaurant owned by Sita's mother in Penang for the past 28 years left off. Now a trained chef in her own right, Sita Jayadeva acquired her passion for food and cooking skills from her mother. Together with Chan, they conceived everything for Montien from scratch with stunning results. Firstly, its interior furnishings are significantly different from other Thai restaurants with nary a wooden sculpture nor carving in sight. Befitting its Thai name of heavenly palace, Montien is modern and chic with predominantly dark wood and frosted glass accents in stark, clean lines. Walls are done up in warm hues whilst Thai silk throw cushions add soft bursts of colours throughout. The outlet has been garnering rave reviews since its opening. Already many customers are fast becoming their regulars who return to dine with family and friends twice or thrice weekly, and helping to spread the word. So what is so different about its food? Since most of the recipes are culled from Sita’s personal collection, diners can expect some delicious surprises. Having dined there on two occasions, I dare say Montien’s specialties left a most favourable impression. 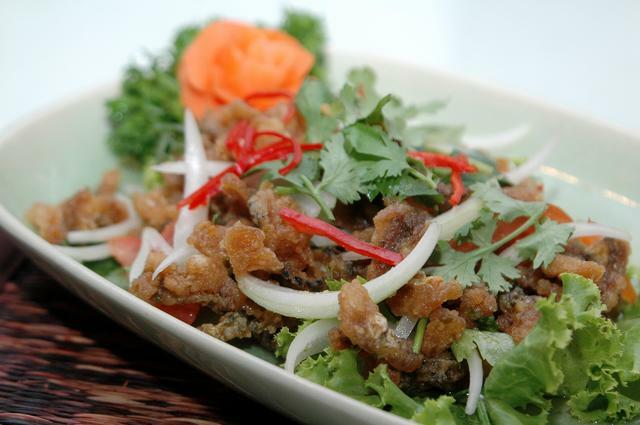 The fish skin ‘kerabu’ or salad known as Yam Narng Pla Krob (RM20++) is a tantalizing starter with pieces of deep-fried red snapper skin tossed in a refreshingly tart and mildly salty salad of sliced tomatoes, red chilli, onion and coriander. Moving on to its signature dishes, you must try its mouth-watering ‘Nahm Prik’ concoctions - tasty Thai relishes eaten with fresh vegetables. 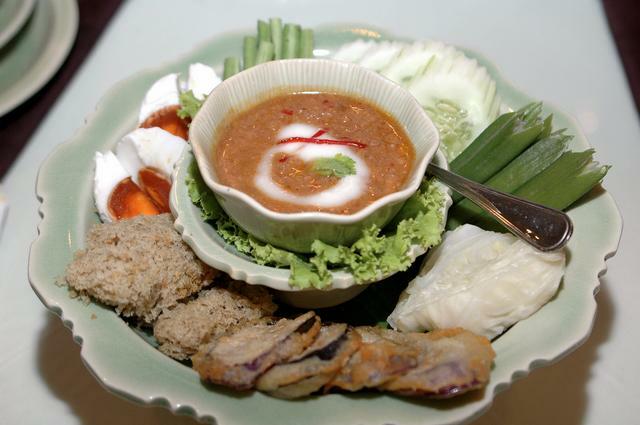 The Nahm Prik Long Rea (RM14++) is a thick dipping concoction made with minced chicken, dried prawns and salted egg. Served with a platter of raw long beans, sliced cucumber and cabbage, fried brinjal, steamed okra and crisp-fried flaked catfish, the flavourful dip proved to be so irresistible that even my dining partner who usually shun veggies, ate this healthy platter without any complaint! I can hardly wait to return and savour the others – Nahm Prik Kapi (spicy shrimp paste relish), Nahm Prik Pla Tu (mortar-pounded frigate mackerel relish), Nahm Prik Ma Krea Yau (brinjal and egg relish) and Nahm Prik Kung Kaew Khai Tom (glass prawns and boiled egg relish). Special mention also must be made of the Montien Platter (RM20++) that entices you with a great combination of Thai ‘money bags’ (a daintier version of Chinese wontons), prawn cakes, stuffed beancurd with minced prawns and chicken, steamed sago balls filled with minced chicken served with fresh chilli and lettuce. 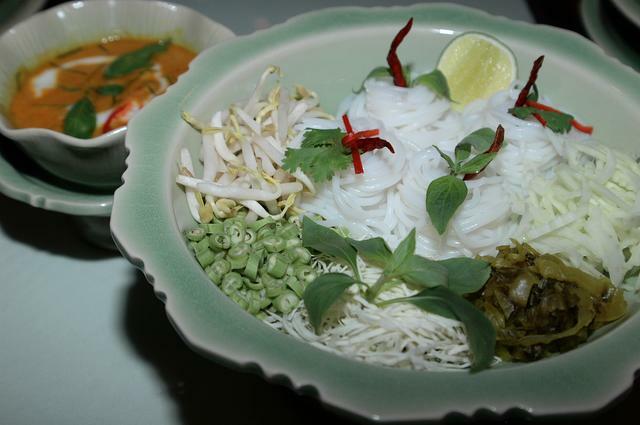 Another ‘must try’ is Khanom Jeen or Thai Laksa. Rice noodles are accompanied by fresh vegetables such as beansprouts, long beans, shredded cabbage and cucumber, salted vegetables and a lime wedge in a rich fish (RM18++) or prawn (RM22++) curry. It was a splendid combination of flavours and textures, with the smooth rice noodles acting as the perfect foil for the aromatic and creamy curry with the raw, crunchy vegetables tempering the gravy’s richness. Personally I found this scrumptious Thai laksa as good, if not better than the one that I had tasted in Bangkok last year. If you are partial to curries, the Chu Chi Kung (RM30++), prawns cooked in a special Thai curry paste and Massaman – Thai Muslim curry (RM25++) will certainly whet your appetite. 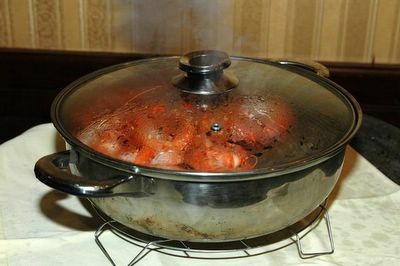 The large, fresh prawns came split in halves, generously covered with thick, fiery red gravy. Redolent with exotic Thai spices and shredded kaffir lime leaves, the sublime prawn curry tasted out of this world. Not overly spicy but enough to leave your tastebuds tingling. 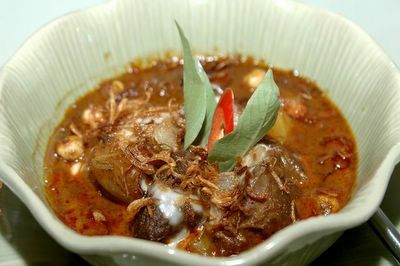 Just when we thought nothing could outshine this rich, indulgent delicacy, along came the Massaman lamb curry (RM25++). This delicious Southern Thai Muslim curry originated as far back as the 16th century. It is hard not to be enthralled with this superb dish of tender cubes of lamb and potatoes prepared with fragrant Thai spices, sliced onions and crisp-fried sliced shallots. We found that the Thai cardamoms in the gravy – they look like chickpeas but are smaller in size – imbued the curry with a delicate citrusy-peppery aroma and taste. Set lunch priced at RM25++ per person is now available to cater to the office crowd who wish to enjoy a quick, sumptuous lunch. The menu changes weekly and will comprise two starters, rice with a curry, dessert and a cup of jasmine tea. 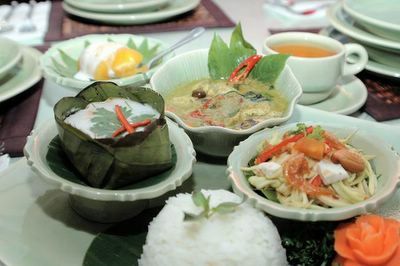 The first lunch menu, for example, will incorporate Hor Mok (a smooth mixture of fish, curry paste and coconut milk steamed in banana leaf cups), Thai mango salad with minced salted egg and dried shrimps, green chicken curry with white rice and caramelized tapioca with coconut cream. 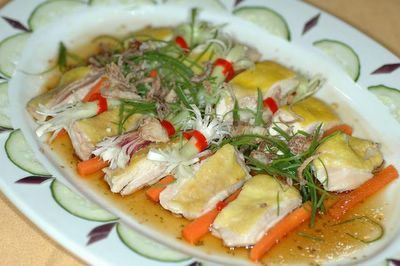 “It also serves as a good introduction to our specialties for those who have yet to try us,” said Vivian. 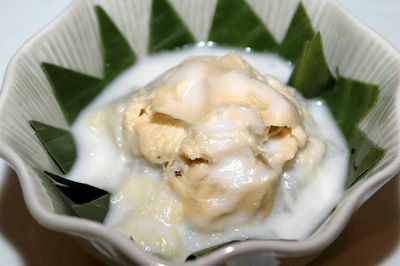 Dessert runs the gamut of the usual Tham Thim Grob (waterchestnuts and sliced jackfruit in fragrant coconut milk RM7++) to the less commonly found Ma Muang Nahm Pla Wan (crunchy green mango sliced and served with special Nahm Pla Wan dip RM10++). We sampled the Man Chiem (RM7++), a delightful Thai dessert of steamed tapioca topped with coconut cream and sesame seeds, and Khao Niaw Thurian (RM12++). The former came up to expectations – we also had this on our previous visit and it was just as good. Now if you are die-hard lover of the King of Fruits, then the latter is an absolute ‘must have’. The glutinous rice was warm and had a lovely chewy texture. Generously topped with sinfully sweet and creamy durian purée and smooth coconut cream, it was just heavenly! Our only worry is this dessert can be a little inconsistent as it hinges very much on the quality of durians used. Having had this on our last visit, it was a little disappointing as the durian purée turned out to be a little chalky and stringy. Nevertheless, don’t let it deter you from ordering this wicked sweet – I am sure the outlet will strive to keep up its high standards to ensure this turns out right. And with the durian season in full swing, there’s no better time to sample this dessert. The outlet has a seating capacity for 50 downstairs and 80 for upstairs including the al-fresco patio. If your jaded palate needs spicing up, Montien is just the place to have a truly Thai dining experience. Melaka is under sieged - this time by hordes of tourists! It's amazing how bus and car loads of them swarmed this tiny state famed for its rich historical past and super-hyped up Peranakan and Portuguese food. Despite numerous visits to Melaka in the past, we have never had the chance to sample its famous chicken rice balls - a novelty and really major draw for any visitors to this part of the world. I kid you not! So we were determined on that very weekend that we would get our hands on some, by hook or by crook. Maybe it was the unbearable scorching afternoon heat, the endless stream of holiday makers or maybe it was just plain complacency...I knew we were suckered into the hype of these so-called famed chicken rice balls the minute we sat down and were very much welcomed with some really bad attitude from the lady server. While the foursome ahead of us were kind enough to vacate their table for us (we had our cranky seven year old girl in tow) rather speedily, one of the workers who helped to clear the table gave us a taste of the ugly Malaysian inhospitality. Her unsmiling face and surly manner were quite enough to curdle your blood - obviously she reckoned we were undeserving of some simple, basic courtesy despite being paying customers. When we placed our order for half a chicken and four portions of rice balls, she haughtily told us off that she was most certain it would be insufficient for us three adults and a kid, and rudely warned us that should we even dream of asking for additional orders of the chicken and rice balls, then we had better be prepared to wait! I was shocked and irked by her rudeness but I stood my ground and told her firmly that we were satisfied with our decision, thank you very much. As it turned out, the meal was really nothing much to shout about. We just could not figured out what was all the fuss about ... ok the free-range chicken tasted so-so. It was not spectacular - the meat was lean and tasted all right with soya sauce and fragrant sesame oil but that was about it. The novelty of seeing the chicken rice done up in smooth ping-pong balls (only these were slightly larger) soon wore off and we were not induced to eat more of it. Seriously, it was quite tasteless and greasy which made the experience of eating this specialty a non-event. Children being children, my kid ate up most of her portion thanks to the fact that they were rice balls and not the usual heap of steaming rice one would get else where. I had to lace mine with lots of chilli sauce - at least the condiment was above average - it was a perky concoction of vinegar, ground chillies, garlic and shallot. Let's just say the next time we return to Melaka, we won't be hankering for chicken rice balls that's for sure. Ah, but happily our visit did end on a happy note. After feasting on the superb local durians at this small, makeshift stall along the old road leading to Alor Gajah, the King of Fruits presented us with a completely different experience altogether...looks like we will consider returning to this little state after all. Now that mothers have had their share of loving tributes for the year, this time around it'd be Dad's turn. OK besides the pre-requisite Father's Day cards and ho-hum pressies, it is almost sacrilegious if you don't take the man out for a good chow-down. After all, a man's heart is through his stomach no? In KL, one can eat well regardless of price but hey, are you gonna stinge on Dad? Besides posh hotels, stand-alone eateries are now getting into the act of whipping up extra-special scrumptious delights just for that day. 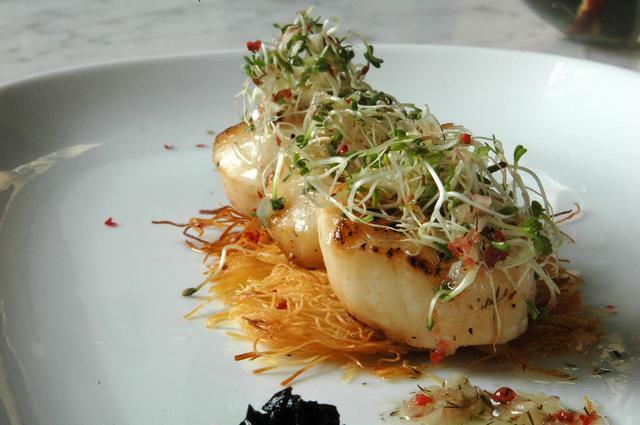 Trendy eatery, Bon Bon Brasserie in Bangsar is one of them. Chef Dhillon Ng's ‘home-style’ French-European dishes comprise mainly meat items matched by strong, robust flavours are supposed to reflect Dad’s masculinity. 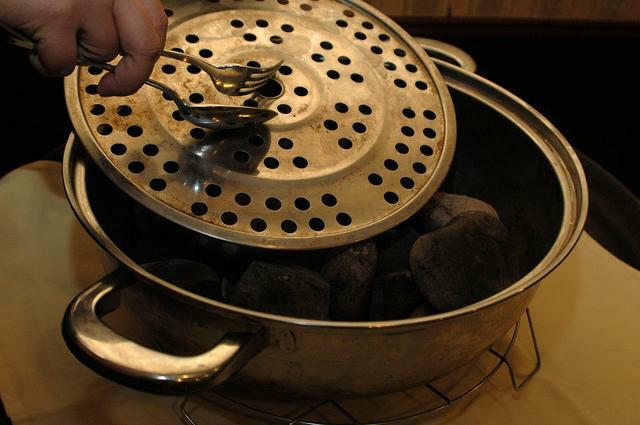 Of course, seafood and poultry dishes are included for fathers who prefer these. 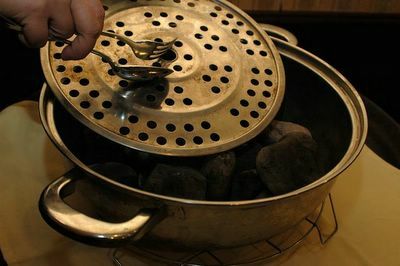 I suspect most Dads will enjoy the amuse bouche (literally translated, it means amusement for the mouth - French-style appetizer in short). Although you won't get an inkling of what it will be come Father’s Day, ours was a dainty slice of seared tuna with grated pickled ‘daikon’ (radish) and pesto on toast. 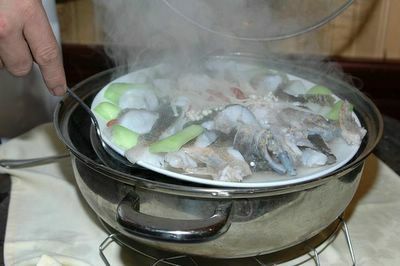 Needless to say it served an exquisite prelude for the other specialties to come. Out of the seven starters that will be available, we sampled two – seared scallops on kataifi nest with dill shallot vinaigrette and sautéed field mushrooms with Saint Maure goat cheese and garlic jus. The dill shallot vinaigrette perked things up a little but it was the finely chopped kelp pickles and sesame seeds that struck a memorable affinity with the scallop trio. Despite the slightly burnt phyllo casing, we were all for the sautéed ‘chanterelle’, trumpet and button mushrooms. The baked starter turned out to be a heavenly match between the mushrooms’ rustic, earthy flavours and the mildly salty, robust and nutty nuances of the Saint Maure goat cheese. A drizzle of aromatic garlic jus added that final flourish to this delectable creation. Again we were impressed by the clever combination of different textures – how well the light, spongy texture of the mushrooms offset the crispy phyllo pastry and soft, melty goat cheese. Anyway I discovered that Saint Maure is considered one of the best goat cheeses in French cuisine. This gourmet delight is easily recognisable by its small log shape and thin, smooth rind with blue-grey moulding. It also has a long straw traversing the middle for holding together this soft cheese and to ensure easier handling. Other enticing choices include consommé of beef with ravioli of oxtail and foie gras, salmon gravlax with pickled fennel, pearl onion and extra virgin olive oil, seafood bisque, terrine of foie gras with port and spices and homemade brioche and Bon Bon’s best-selling duck rilette in phyllo with crisp fennel and spiced honey. 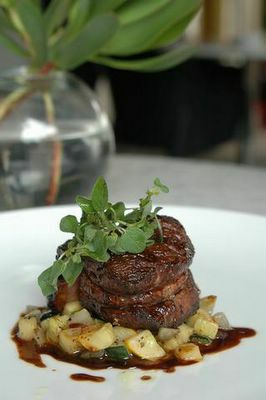 Of the seven main courses, we can vouch for the pan-roasted fillet of beef. Nicely seared on the outside, the tender beef fillet remained pink and juicy inside. Accompaniments for this are vegetable caponata (a Sicilian relish of eggplant, onions, tomatoes, anchovies, olives, pine nuts, capers and vinegar cooked in olive oil) and tapenade jus (a Provençale paste made from capers, anchovies, ripe olives, olive oil, lemon juice and seasonings). 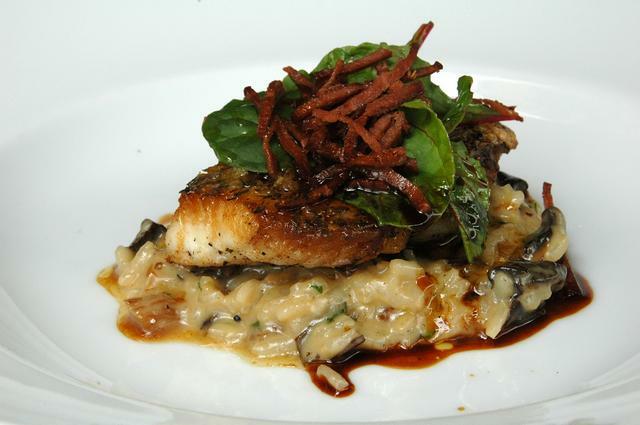 Equally good was the seared emperor snapper with mushroom risotto and crisp chorizo. This imported fish from Australia is highly regarded for its sublime texture and clean, clear flavour. We thoroughly enjoyed the snapper’s firm, sweet flesh paired with the creamy risotto (an Italian delicacy of cooked short-grain rice) richly imbued with the beguiling aroma and slices of mushrooms and fine strips of crisp chorizo (Spanish beef sausage). The remaining mains comprise braised lamb shank with saffron, herbs, dried fruits (a mixture of dried pineapple, jackfruit, apricot and prune) and garlic mash, roast spring chicken with sautéed vegetables and truffle jus, roast beef polenta with haricot vert (green beans) and pommery mustard jus, seared duck breast with garlic mash, pea sprouts and orange marmalade jus and pan-seared cod with red miso, roma tomatoes and haricot vert. 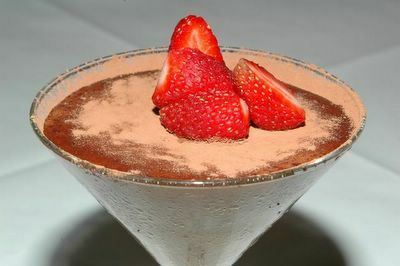 Cap off your celebratory lunch or dinner with any of these six desserts – mini pavlova with strawberries in a passion fruit soup, mango mille feuille (rectangular French-style pastry consisting of thin layers of puff pastry sandwiched with cream and mango), lemon tart with chocolate mousse, classic vanilla crème brûlée, chocolate torte with espresso ice-cream and Valrhona chocolate mousse with Grand Marnier. We had the crème brûlée (it means ‘burnt cream’ in French) which is top-notch. This classical treat with its superb custard-like texture and a caramelized sugar topping is not overly sweet and will appeal to light eaters. The Valrhona chocolate mousse is more decadent as the ultra-smooth and rich chocolatey mousse is laced liberally with the renowned Grand Marnier orange liqueur. With the flexible option of having two courses for RM58++ or a three-course meal for RM70++ per person, we reckon this special feast with Dad won't burn such a big hole in your pocket.